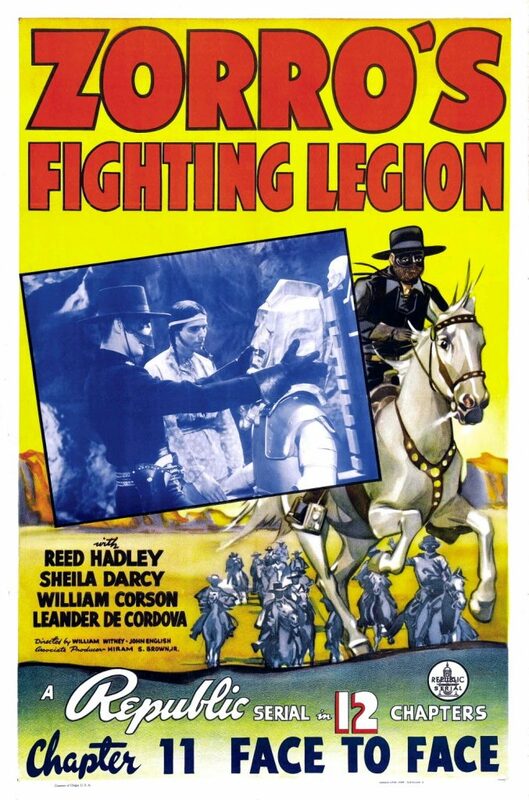 Zorro’s Fighting Legion is a 1939 Republic Pictures film serial consisting of twelve chapters starring Reed Hadley as Zorro and directed by William Witney and John English. The plot revolves around his alter-ego Don Diego’s fight against the evil Don Del Oro. A trademark of this serial is the sudden demise of at least one native informant in each episode. The direction was identical for each informant’s death, creating a source of unintentional humor: each informant, upon uttering the phrase, “Don Del Oro is…”, is shot by a golden arrow and dies before being able to name the villain’s alter ego. The serial is also unusual in featuring a real historical personage, Mexican President Benito Juárez, as a minor character. It is the second in a series of five Zorro serials: Zorro Rides Again (1937), Zorro’s Black Whip (1944), Son of Zorro (1947) and Ghost of Zorro (1949).